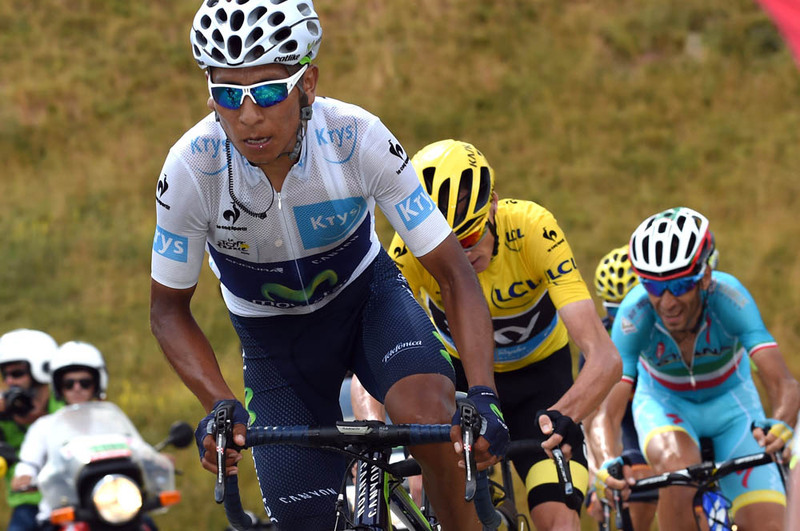 Colombian Nairo Quintana, second in the Tour de France behind Sky’s Chris Froome, will race the Vuelta a España starting on August 22 in southern Spain. Spain’s Movistar team in blue confirmed his participation this morning in a press release. Despite his selection, Quintana reportedly wanted to skip the Vuelta after racing the Tour. Quintana and Spaniard Alejandro Valverde will form part of Movistar’s nine-man team. With Froome’s expected confirmation, the Vuelta will feature the three podium finishers from the Tour. The five-foot-two climber pushed Froome to the limit on the final mountain days to La Toussuire and Alpe d’Huez. He clawed more time out of Froome’s lead, but could not take enough. He finished second at 1-12 minutes in Paris when the race concluded one week ago. The Spanish grand tour starts in three weeks in Marbella, Andalusia, with a short 7.4-kilometre time trial. The Vuelta a España appears to be a Tour de France rematch with all the top stars except 2014 winner Alberto Contador (Tinkoff-Saxo) expected to race. Contador, after winning the Giro and placing fifth in the Tour, already ended his 2015 season. The 2010 Vuelta and 2014 Tour winner Vincenzo Nibali (Astana) confirmed on Friday that he will race alongside team-mates Fabio Aru and Mikel Landa – second and third in the Giro. Tejay van Garderen, Samuel Sánchez (both BMC) and Joaquím Rodríguez (Katusha) will participate, as well. Sky has yet to announce it, but Froome is expected to lead its team in the Vuelta after twice finishing second overall. Quintana won the Giro in 2014 and aimed for the Vuelta, but a crash in the time trial forced him to abandon. In his only other attempt in 2012, he placed 36th overall. He was due to defend his title in the Vuelta a Burgos starting tomorrow, but will now head straight to the Spanish grand tour. He will lead the team with Valverde, who, besides finishing on the podium six times, won the 2009 Vuelta.